First Aid Beauty is a skincare and cosmetics company. Best known for carefully crafting their skincare solution formulas and ensuring that each ingredient is safe for sensitive skin, First Aid Beauty believes that skincare needs to be personalized for the individual’s skin. With Big Apple Buddy’s personal shopping service, you can now buy First Aid Beauty’s products from the USA First Aid Beauty online store anytime, anywhere. 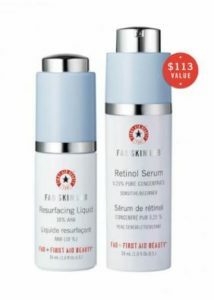 The FAB Skin Lab Duo features not one but two of FAB Skin Lab’s anti-aging skincare products—the Retinol Serum and the Resurfacing Liquid. The Retinol Serum smooths wrinkles and leaves you with firmer skin. The Resurfacing Liquid brightens and smooths your skin, making it appear less dull and rough. Get the duo and you’ll save 20% more than you would buying these products separately. Looking to cure your dry skin? Get FAB’s online exclusive Ultra Repair Cream in either Rosemary Mint or Vanilla. This product is extremely hydrating, leaving your skin smooth and soft after just a single use. It’s safe for sensitive skin and even helps relieves irritation from eczema. 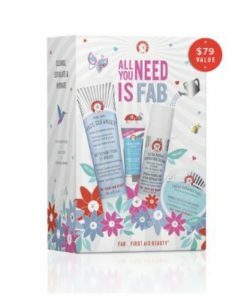 If you want a taste of several of FAB’s skincare products, get FAB’s All You Need is FAB Kit. In this kit you’ll get FAB’s Pure Skin Face Cleanser, Facial Radiance Pads, Ultra Repair Hydrating Serum, and Coconut Water Cream. This is a great why to try some of FAB’s best-selling products. First Aid Beauty retailers are located in the US. 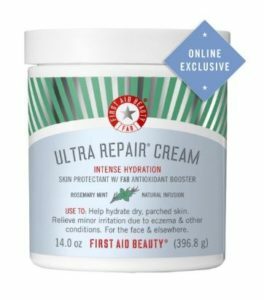 The USA First Aid Beauty online store unfortunately does not offer international shipping. Not to worry though! Big Apple Buddy, your personal shopper, can help you buy products from the USA First Aid Beauty online store and ship them to your doorstep, no matter where you are in the world. We offer international shipping to over 110 countries including Australia, Austria, Azerbaijan, Bahrain, Belgium, British Virgin Islands, Brunei, Bulgaria, Canada, Chile, Costa Rica, Croatia, Czech Republic, Denmark, Estonia, Fiji, Finland, France, French Polynesia, Germany, Gibraltar, Greece, Greenland, Hong Kong, Hungary, Iceland, Indonesia, Ireland, Israel, Italy, Japan, Jordan, Kuwait, Latvia, Liechtenstein, Lithuania, Luxembourg, Macau, Malaysia, Maldives, Malta, Marshall Islands, Mauritius, Monaco, the Netherlands, Netherland Antilles, New Zealand, Norway, Oman, Poland, Qatar, Romania, San Marino, Saudi Arabia, Serbia and Montenegro, Seychelles, Singapore, Slovak Republic, Slovenia, Spain, South Africa, St. Lucia, Sweden, Switzerland, Taiwan, Thailand, the UAE, the UK, Vatican City, and Vietnam. If you would like to buy from the USA First Aid Beauty online store, simply let us know which items you would like to order (by filling out the form below) and we’ll get back to you with a free international shipping quote within 24 hours!